“In the summer of 2014 I was searching for the spring of the Cetina River in the southern part of Croatia, near the Dinara Mountain and the Bosnian border. I arrived to a small village where the beautiful Cetina River runs. On the top of a hill there was an Orthodox Christian church overlooking the Cetina Spring. 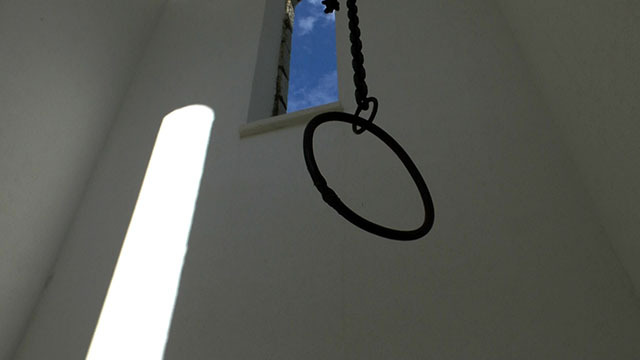 Next to the church I spotted a bell tower and inside a long chain swaying in the wind. While recording video I heard a distant flute rolling over the hill. The sound was beautiful and eerie, reminding me of Yugoslavia and its end. I wanted to record that sound but could not locate the musician. I came back to the village several times and finally met the flute player. His music became the main component for the soundtrack of South Slavic Requiem.